CIVILIZATION RESTARTED 13000 YEARS AGO FROM ANUNNAKI ON MARS? Presidential Candidate and whistleblower Andrew Basiago says, “Solar System catastrophe utterly devastated Mars and Earth [it made Earth’s Deluge]. Our ancestors–advanced, intelligent, tool-using humans as are we–survived at a primitive level. Basagio’s 5000 member Mars Anomalist Research Group [you can join on Facebook] publishes photographic proof that what they call “high Egyptian civilization” flourished on Mars, before 13,000 B.C., when Ra-Marduk, Anunnaki ruler of Egypt, ran Mars-Base. When Nibiru passed between Jupiter and Mars, the passing destroyed all the advanced development on Mars, Anzu–boss of the Nibiran astronauts on Mars, then (after the Anunnaki executed Anzu for treason) added under Marduk, had created. Mars had expanded Marsbase, to create recreation facilities, lack of which had fueled Anzu’s rebellion. Basaigo cites data NASA’s rover Spirit recorded on day Sol 2012, that proves Ra’s Egyptian civilization rocketed to and from Mars. 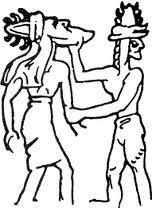 The Mars Anomalists have published irrefutable evidence of contact between Marduk’s high Egyptian [brought by Marduk’s father, Ptah-Enki, from Sumer-Iraq] civilization and Mars. On Spirit’s right side, we see an intaglio–a piece of stamped or carved metal or rock–on a flat slab. The image stamped or carved on the slab shows an Egyptian pharaoh-someone who possesses both African and European features. “Egyptians,” says Basiago, “to make peace with their Ethiopian adversaries, adopted the brightest Ethiopian children into their ruling class and groomed them to become pharaohs.” The pharaoh depicted on the tag “bears a striking resemblance to President Obama, himself a person of mixed racial heritage. 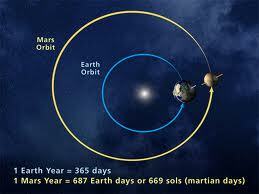 Anunnaki rocketed supplies to Mars from both Nibiru and Earth. They used rockets to take people and genetic starts from Nibiru to Earth and to return Nibirans from Earth and Mars back to Nibiru. They also freighted refined gold from Mars to Nibiru. But, Basiago suggests, the Anunnaki had another way to transport goods and people. The pyramids of both Earth and Mars, Basiago says, may have contained teleportation devices like those our clandestine government has used for the last 50 years. The transporters in the pyramids of Mars and Earth, he “were probably transportation devices, like the Tesla Teleporters I confronted in Project Pegasus. The transporter devices propagated radiant energy between two straight- or ellipical-shaped armatures we leaped through to literally tunnel to Mars.” Simialrly, reports from Angkor Wat, report Cambodian traditions of their highest tower, one shaped like an Anunnaki spacecraft (Vimana). The Khmer ruler retired alone each night and experienced a device, mythologized as a snake that turned into a beautiful woman, who took him to the home of the gods on Mount Mashu. This seems like the same sort of experience Basiago and the pharaohs of pre-diluvian Egypt describe. Basiago, in his paper, The Discovery of Life on Mars, analyzed NASA’s pictures of Tsiolkovski Ridge, found an extensive monument, similar to that found on Earth in the Andes at Tiahuanaco, at the entrance to the Anunnaki base at Ollantaytambo. These monuments–Tsiolkovski Ridge on Mars and Tiahuanaco on Earth displayed statuary of the various species that sojourned there. “Tsiolkovski Ridge is a heritage sculpture-garden in which they left memorials to the groups in antiquity who were reaching Mars.” Statues there include, in the southern corner of the ridge, “an Asiatic head” like the Budda-heads of Southeast Asia and China–a very rotund face with epicanthic eyefolds. Epicanthic eyefolds emerged on Earth at the end of the last ice age, 20,000 years ago–before Earth’s Deluge. “The life on Mars consists of intelligent, bipedal hominids capable of carving statues and building structures and a variety of animal species that exist, that once existed, or that have never existed on Earth. Reptilian species predominate. Among the numerous colossal heads that litter Tsiolkovski Ridge can be seen a large gold face of the highly articulated Gray species that has appeared in the UFO literature. “A photograph of the Martian surface that was taken by NASA’s Mars Exploration Rover Spirit during November 6-9, 2007 and beamed back to Earth” shows earlier Martian settlement [NASA-JPL ; PIA10214]. “This photograph is a panoramic montage of a series of photographs taken by the Rover Spirit from November 6th to 9th, 2007. At the time that it was taken, the Spirit was perched near the western edge of the plateau called Home Plate in the inner basin of the Columbia Hills range inside Gusev Crater. 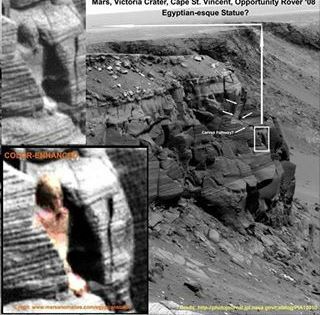 “Artwork on Mars found thus far consists almost entirely of statues of human and animal heads, intaglios carved casually on rocks featuring human and alien faces, and vast etchings carved on the ground conveying human and animal themes. “Giant grotesque heads exist in several places (including The Rock Garden) that are either the skulls of large, dead hominids or sculptures designed to resemble demonic entities, with head and hands rising from below to devour or bury those on the Martian surface. “The built structures found in the photograph include evidence of stairways leading to ornate rock sculptures of substantial refinement; derelict waterworks; metal works of exotic design that may once have served as viewing platforms, one forming the stylized face of a bovine or reptilian; and several large stone sarcophagi, including the ossuary of a king in the Egyptian style laid on a cliff top and another in the Easter Island style half-buried in the valley below. There is evidence of extensive digging into the Martian soil.The panorama itself presents massive evidence of a cataclysmic event in Martian history. The western edge of the Home Base plateau and the West Valley below are littered with the half-buried remains of thousands of victims of an apparent deluge, caught in alluvial deposits like slag heaps that resemble a pebbled moraine. This cataclysm may have been the destruction of the planet Maldek [Tiamat], which created the asteroid belt and pummeled Mars so that it was squeezed into an oblate spheroid and fractured. Mars’ signage, says Basiago, warns humans of predatory beasts. Andrew Basiago is a lawyer enrolled in a US secret space program/CIA mars visitation program/time travel and teleportation programs under DAARPA as a early as age 7, to when he was young adult. There were 140 kids and 60 adults in the program. He went to Mars regularly for a decade. He time traveled dozens of times. The program is still active. 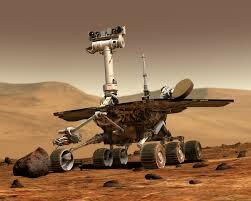 As of 1980, 97,000 people were already sent to mars, and only 7,000 have survived on the surface for 3 years. Basiago recalls being able to breathe, no water on the planet, and he also recalls being greeted by CIA workers upon his first Mars arrival. 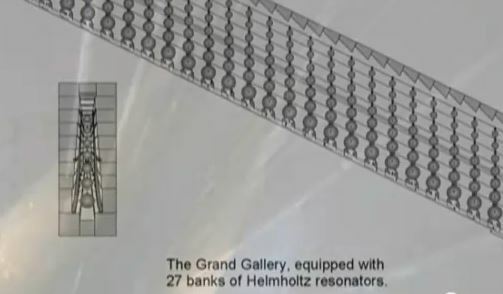 He says there may bebases on mars that contain hundreds of thousands of people, as revealed by Bob Dean (Project Camelot) at the European exopolitics summit. LAURA EISENHOWER, Ike’s great grand daughter of a president revealed she was invited to join the secret US colony on mars Laura, 25 years after Basiago & Stillings’ class). BRETT STILLINGS Stillings also teleported the jump room on Mars. 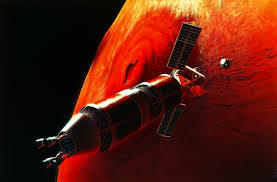 On one trip to Mars, Stillings found Basiago already there; Basiago stood, right there in the jump room station on Mars, next to Barrack Obama (who was Barry Soetero then). Stillings confirms that the jump room training sessions Ed Dames identified both Barack Obama and Basiago as future presidents. 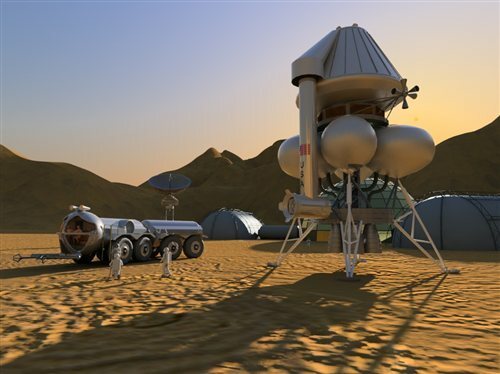 The Nibiran astronauts, called the Igigi, rebuilt Mars’ base. When, 13,000 years ago, the Deluge threatened, Enlil ordered Marduk and his followers to shelter on Mars and the lineages the Igigi from Mars had begat to shelter atop Earth’s peaks till the waters receded. To Baalbek [Lebanon] Enlil summonsed Nibirans who survived the flood on the Earth’s peaks and the astronauts in spacecraft orbiting the planet. He also called in Nannar from the moon and Marduk from Mars. The Nibirans set out Earth’s pyramids both in Giza and Tiahuanaco exactly as they’d set out Mars’ pyramids just west of Alalu’s statue. Near Cyndonia, they raised beds of crops they irrigated from canals that reached the nearby lake [NASA Frame 52-A-35, Plate L]. On both Mars and Giza, the Nibirans marked their pyramids’ entrances with statues. On Mars, the mile-high statue that fronted their big pyramid featured Alalu’s face [Viking photo 76-A-593/17384]. 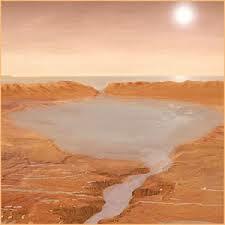 Alalau’s head rose a half-mile above Mars’ plateau. In Egypt, where the Nibirans built the Giza complex much later, around 10,500 B.C., the statue of a crouching lion (Sphinx) initially featured the face of Ningishzidda-Thoth, who’d designed the complex. In 3100 B.C., Marduk-Ra displaced Ningishzidda from Egypt. Marduk replaced Ningishzidda’s face on the Sphinx withthe face of his murdered son, Osiris. 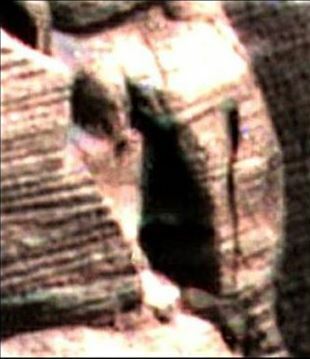 The face of the Sphinx face mirrored Alalu’s statue’s face on Mars.